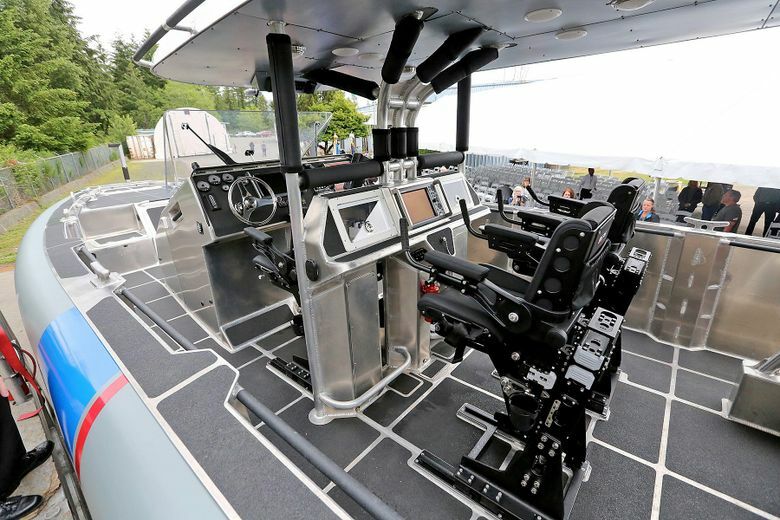 The Bremerton-based company has delivered the first of a new line of aluminum patrol boats that can travel at more than 60 mph to interdict smugglers or other intruders along the nation’s coastline. There was a rare pause on the production floor at SAFE Boats International in Bremerton last week as more than 300 employees, government officials and officers of the U.S. Customs and Border Protection agency celebrated the handoff of an aluminum patrol boat that can travel at more than 60 mph to interdict smugglers or other intruders along the nation’s coastline. 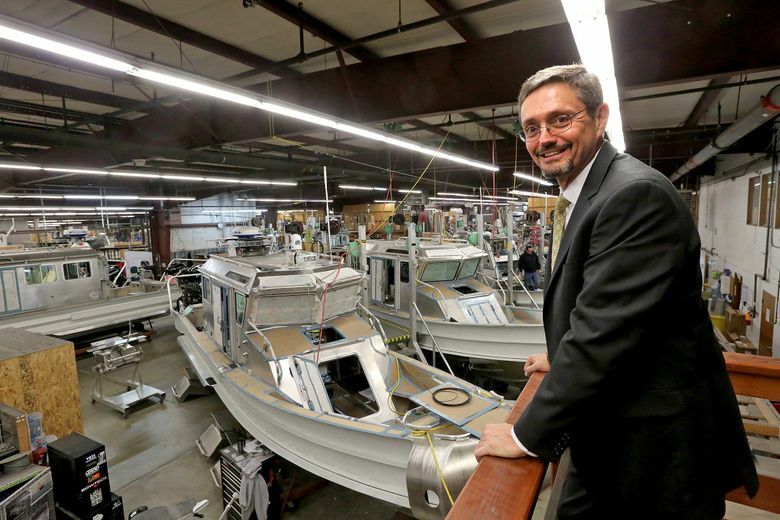 Speeches and tours might not be expected for the 2,000th boat build by SAFE, a growing boat builder that’s one of Kitsap County’s largest private employers. But this was the debut of the company’s Coastal Interceptor Vessel, the first of a possible 52-boat order from the border agency, worth up to $48 million. The 41-foot-long vessel is designed for maneuverability, speed, range and seaworthiness, capable of carrying nine people and cruising at 54 knots. The Interceptor “appears to be the wave of the future for us,” said Edward Young, the border agency’s deputy assistant commissioner supervising Air and Marine Operations. SAFE’s Interceptor boats are expected to go into service where smuggling and other border issues are most intense: San Diego, Miami, Puerto Rico and the Caribbean. On any given day, SAFE’s 375 employees can be working on 15 to 25 boats. The boats sit lofted above the factory floor, multiple workers laboring on each one. SAFE Boats (the acronym stands for Secured Around Flotation Equipped) builds 75 to 100 boats a year at facilities in Bremerton and Tacoma. CEO Dennis Morris, who joined the company in 2013, said the company’s focus on law enforcement and security means it’s easy for the employees to see the benefits of what they are building. “In a way they feel a part of the mission that these guys [law enforcement and military] are taking on, and there’s a real pride in that, and that’s very contagious,” Morris said. This attitude seems to carry throughout the entire company, from the leadership to the people actually working on the floor. “When we’re watching the news at night and we see one of our boats saving a life, it’s huge” said Bill Bozarth, an integration manufacturing engineer. Bozarth has worked at SAFE Boats for eight years. He started as a rigger responsible for setting up electrical wiring and piping. Now he works with the crew that installs complex components such as steering, navigation, communication and fuel systems. Bozarth said he likes the environment, where everyone up to CEO is on a first-name basis, and he still gets a thrill from testing the boats he’s built. Established in 1997 with a handful of employees, SAFE Boats recently has been on a growth spurt. In the past year it has hired more than 50 employees, though not all were new positions. The company won’t disclose its sales, but a federal government contracting database indicates its annual revenues are about $70 million. About a year ago the company considered consolidating in the Tacoma facility, which benefits from close water access and is where SAFE builds its largest vessels, up to 85 feet in length. The Bremerton location is landlocked, meaning boats must be taken by trailer to another location for testing. SAFE Boats chose to keep both facilities, though, citing its relationship with the Bremerton community and port, and its established and highly skilled Bremerton-based workforce. “We’re not a Microsoft or an Amazon, but in our own small way we are very influential in this community,” said Morris. With stable footing in Bremerton, SAFE Boats is continuing to pursue opportunities for growth. It is working with the Port of Bremerton to figure out how to expand its footprint there, and hire 30 to 40 new employees by the end of the year. The company will soon introduce a “multi-mission interceptor,” described as the baby brother of the Coastal Interceptor but smaller and highly customizable. The company is also cranking along on a 2012 contract with the Coast Guard that called for 101 boats over a seven-year span. Each such project opens further opportunities, said Morris. “There are some things coming down the pipe with the U.S. Navy and the Coast Guard and because they are complex and with high volumes, we think we are in a good position because we understand the complexity and what it takes to do it,” he said. SAFE Boats also sees room for growth in the international market, said Schwarz. Through the U.S. government’s foreign military-sales programs and direct sales, it already has vessels operating in Mexico, Nigeria, Pakistan and Russia.